Cherry, the foremost provider of computer input devices, presents the MW 8 ADVANCED wireless mouse. This mouse offers innovative features and is built to meet the highest standards of the most discerning user. The MW 8 ADVANCED joins Cherry's portfolio as the new flagship mouse, combining timeless design with state-of-the-art technology. The CHERRY MW 8 ADVANCED features an elegant metal surface made of brushed aluminum that conveys the highest-quality workmanship. The rubber pads have the Voronoi cell structure on both sides of the mouse to ensure a good grip. The MW 8 ADVANCED fits the hand perfectly, making it a pleasure both to look at and to use. To top off the MW 8 ADVANCED, Cherry added additional sophisticated features. For instance, the mouse includes an extra durable mouse wheel with optical scanning, a magnetic lock for the USB receiver, and a transport bag. These features make the MW 8 ADVANCED equally well-suited to mobile and stationary applications. The CHERRY MW 8 ADVANCED not only looks and feels nice, but is also a top performer. From a technical point of view, MW 8 ADVANCED boasts the high-precision PixArt "track-on-glass" laser navigation sensor with optical scanning, ensuring the mouse can work on nearly any surface – including glass – without a mouse pad. In addition, the sensor resolution can be adjusted in four steps between 600, 1000, 1600, and 3200 DPI (dots per inch), ensuring the MW 8 ADVANCED is suitable for use with 4K monitors. The MW 8 ADVANCED also has multiple connectivity options. Users can simply connect the mouse to a compatible system using the built-in Bluetooth 4.0 functionality. Alternatively, one can use the supplied USB receiver to establish a 2.4 GHz wireless connection secured with AES-128 encryption. Switching between the two modes of connectivity is a breeze, and is done by sliding the switch at the bottom of the mouse. Using this feature, you can connect the CHERRY MW 8 ADVANCED with a notebook and desktop PC at the same time, quickly switching between the two with the simple slide of a switch. The integrated Lithium battery with a generous capacity of 550 mAh ensures a long service life, with one charge lasting up to 70 days. A two-color status LED provides information about the battery charge, the selected resolution, and the connection to the PC. Details about the CHERRY MW 8 ADVANCED mouse are available here. A one-page overview with the most requested technical specification information is attached. Images of the MW 8 ADVANCED mouse are attached. 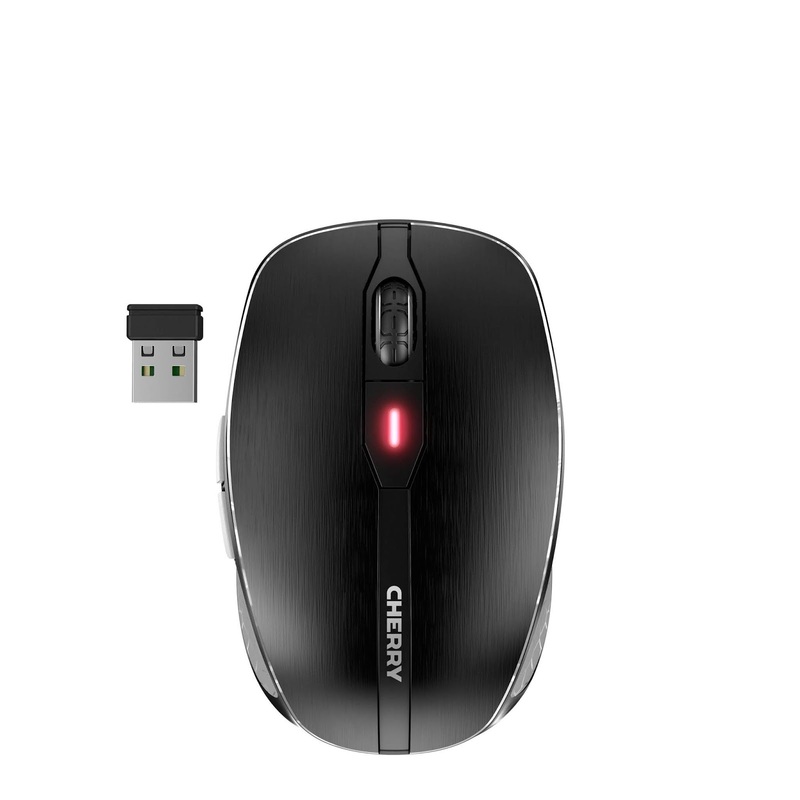 The CHERRY MW 8 ADVANCED wireless mouse is available at a suggested retail price of $50.